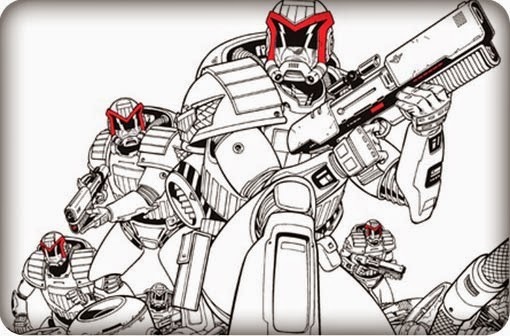 Dredd may be a tough nut to crack, but some situations are too hazardous for even him – situations where Mega-City One’s real heavies are called in. The Heavy Mob follows the toughest mofos in Dredd’s world, from the daredevil Holocaust Squad to the hardened Space Corps, via a trip to old London town to meet Brit-Cit Brute. The Holocaust Squad, introduced in John Wagner’s 1979 Dredd story Father Earth, are a unit thrown into incredibly dangerous situations with little chance of survival. Their own series then ran for two stories in the 1990s – Skyfall and Storm Warning. Robbie Morrison’s Brit-Cit Brute follows London-based bruiser Arthur Conan Newt. Newt’s stories will appeal to fans of Lobo’s hyper-stylised brutality, though both script and artwork can feel too over-the-top compared to Dredd’s grittier satire. Another Morrison script, Wynter, is a fairly standard cop-vs.-robbers story, elevated by its bleak Arctic environment. The stories so far all face a similar problem – this volume’s all-over-the-place composition means that, while we’re introduced to a wide variety of characters, they’re all very similar – big, tough, don’t like orders – and we never stick around long enough to get to know them before moving on to the next story. Thankfully, the final two tales, both recent Dredd strips, make The Heavy Mob worth sticking with. Debris, set in the wake of the Chaos Bug, sees Dredd draft in Space Corps reinforcements against a self-declared independent City Block that’s stealing supplies from relief ships. The Die Hard-esque action is balanced effectively with in-fighting amongst our protagonists, as Colonel Easter wants to nuke the block, but their advisor Dolman insists on finding another solution. Last but not least, Wagner’s Heart of Darkness-inspired Warzone sees Dredd and a Space Corps squad journey into enemy territory on a war-torn colony. It’s full of bloody, nasty action and nicely scripted character and world-building details, all adding up to an exploration of meaningless war. So what we have is a very mixed bag, lacking the focus of previous Mega Collection volumes. The complex, intriguing final two stories only just make up for the first bunch of brutes who we never really engage with, making this one for the hardened collector only.